The traditional model for acquiring new business is to first find the company and second find the CEO. One company located in the bay area of California flipped this idea and decided to invest in individuals first and assist them second in finding the right business to acquire. 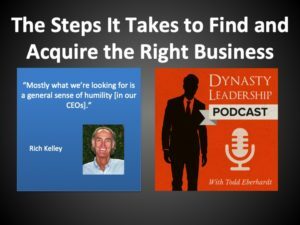 On this episode of the Dynasty Leadership Podcast, Rich Kelley of Search Fund Partners joins the show to discuss his company’s process for acquiring and investing in profitable micro-cap companies. After spending time as a real estate developer as well as the NBA, Rich co-founded and is still a partner at Search Fund Partners. One of the reasons Search Fund Partners is successful is because they are very selective. Through a vetting process, they only back about 40% of the people who make it to the interview process. All of this has led to over 125 acquisitions in the companies history. If you or someone you know is looking to grow your business or has any questions be sure to contact us at Dynasty Leadership.